Want to know more about Attract Readers? We understand you and your blogging problems! We are Ute Wieczorek-King and Jean Wolfe who each took up blogging when blogging first started. Whilst it was exciting and fulfilling we also had to overcome some reluctance to promote ourselves online and still remain “professional". We know that what may be an advantage in your business or life – good education, dislike of self-promotion and a professional approach – may be a barrier when it comes to marketing yourself online. When you start with a disadvantage you miss out on all the amazing opportunities for authentic online marketing. 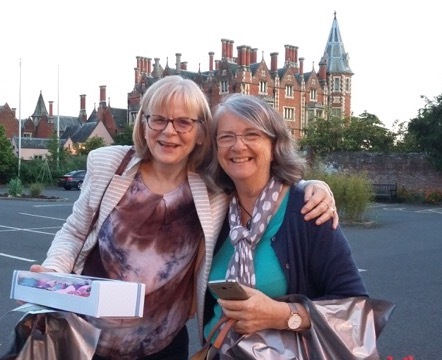 Jean and Ute founded Attract Readers with Alice Elliott in 2014. Alice stepped back 2 years ago but still provides technical support to our Attract Readers clients. Jean and Ute are both specialists in helping people to flourish and businesses to prosper. They enjoy applying the best of their extensive business, marketing, blogging and social media experience in the 'Attract Readers' ecourses and blogging clinics. They see the bigger picture and not just the blogging questions presented to them. This helps their clients to achieve major breakthroughs with their blog or website in a very short time. They will always help their clients find the easiest, most effective solution to any blogging, business or marketing problem. What if you need technical support? We can also help you with pesky or complex WordPress technical issues that can so easily stop a blog's progress. Our colleague Alice Elliot is always on hand to solve WordPress problems via email. Known as the Fairy Blogmother, she has provided the technical 'how-to' modules in the Attract Readers ecourses. Our course users particularly love her simplified WordPress tutorials in the 'Kickstart your first blog' course! Our experience: Social media and blogging - 30 years. Running our own businesses - 40 years! Interests and enthusiasms (apart from blogging and business): Continued learning, gardening, flowers, photography and Instagram, cooking, baking, camping, walking, playing ukulele, growing orchids, theatre, comedy, travelling. France and anything French, going to music festivals,, knitting, crochet, writing poetry. And, of course, our families! So we hope we've covered everything you wanted to know about 'Attract Readers'? If you have any questions, we'd love to hear from you! Please email us here.